Our online Handling Customer Complaints training provides the perfect solution to help those who's job involves interaction with customers. The course will help you learn how to deal successfully with customer complaints in a way that boosts not only your company's reputation but will also earn a good name for yourself. The modular course is easy to use. Applied correctly it will yield an excellent return on your investment. The course consists of an introductory tutorial and four training tutorials with test questions which build into a complete online handling customer complaints training programme. 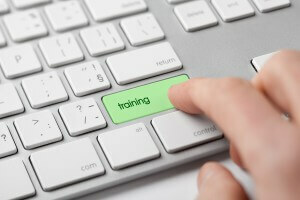 Additional training support is provided via email. Details of the course are presented below - please take the time to view it and if you have any questions then do please contact us. 1) Simply click on the Buy Now button, you will be taken to our secure PayPal site where you can pay by credit or debit card. Once payment has been made you will automatically receive your unique pass key (via email) and can immediately access your online training course. On receipt of your order by method 2 or 3, we will send you an invoice with a secure link so that you can pay for your course using PayPal. Once your payment has been received, we will send you an email with your unique pass key so you can access your online training. Each pass key is active for 30 days.